I need to preface this post with a little disclaimer: I’m not worried about my son. I think he’s doing just fine. He will learn to read–eventually. He’s just not quite ready yet. There is a wide range of “normal” for the learn-to-read stage and he falls somewhere in the middle. So, everything will be ok and we’ll get the reading thing down at some point. It may not be this year though…….sigh…..
Ok, so my son isn’t reading fluently yet. He is slowly making slow, very slow, progress. Did I mention that this process is taking forever? Oh my goodness! How many times must we sound out the same words? I don’t think I can take it anymore! Let me back up a little bit. At our house we only have one reader (umm, besides the parental authority figures, that is). Curly is our reader. And she is a bonafide bookworm. That girl reads like there’s no tomorrow and I can’t keep her supplied with books. However, teaching her to read was not a walk in the park either. When I started our homeschooling journey I was most excited about teaching our kids to read. I love to read! Love, love, love books! I was thrilled that I could teach my kids to read and I just knew they would love it. I was only half right……..
Curly does love to read. But I certainly did NOT enjoy the process of teaching her to read. It was so tedious. It took forever. I had no idea what I was doing. It was just a frustrating ordeal for both of us. I started with How to Teach Your Child to Read in 100 Easy Lessons. After only a few lessons we were both hating it. I did not like how they taught phonics (or didn’t teach it very thoroughly actually). Curly hated the weird font and strange letters and the awkward fast/slow reading thing they encouraged. That book was just so very odd. I tossed it back on the shelf. Then I decided to move into the Phonics Road which focuses heavily on phonics and spelling. The kids are supposed to read through learning to spell and understanding how words are put together. It’s a parts to whole method I guess. Anyway, that didn’t work out well either. Curly was frustrated; she hated spelling; and she just wasn’t getting it. Finally I took her to have her eyes checked and the poor girl was far-sighted. She was struggling to tell letters apart which explained why she kept mixing them up. Once she got her glasses, her reading took off over night. At that point I just supplied her with books and let her go. I’m not sure I actually taught her to read. I think she figured it out by herself. So, after all the failed attempts with Curly I thought I would do better with Tiger. I had his eyes checked – we’re ok there. And I tried a new more systematic program – All About Reading. We made it about halfway through the program when he was 4 1/2 and 5. Then we hit a wall and could not keep moving forward. Suddenly he couldn’t tell a “b” from a “d” and he could not read words with “sh,” “th,” or “ch.” Beginning and final consonant blends were also tripping us up. We practiced and practiced and took breaks and tried again. No luck. After a long break, we started over at the beginning of the program. We were making progress and then his strange “b” and “d” mixup began again. We still sound out nearly every word and listening to him read is just painful. I encourage; I sound out words with him; I praise him; I help him; and I keep helping him practice. Yes, we’ve seen some progress but it’s not at all what I thought. I’m sure he’s not quite ready yet and one day things will click for him and he’ll get a handle on this reading thing. He’s only 6 after all and he’s got plenty of time. He’s not even behind. But working with him to practice reading nearly kills me. At the end of each reading lesson (our super super long 15 minute lessons, mind you), I need a short break and some chocolate. I feel like we make progress one day to lose it all the next. Words he knew one week suddenly fall out of his brain and he acts like he’s never seen them before. Some days he even acts like he doesn’t understand English. Sigh…….Tiger can’t read and some days it feels like he truly will never learn. I just want him to enjoy all the books stacked on the bookshelf in his room waiting for him. I want him to be able to read instructions on worksheets to himself. I need another little independent person in my house. Instead, I’m sitting here listening him sound out the word “sit” for the tenth time today. What ever made me think teaching my children to read would be fun or even exciting? It’s tedious, excruciating, and frustrating. So, what if your child isn’t reading yet? You have to suffer through your friends talking about the chapter books their 4-year-olds blew through in 2 days. It’s painful to hear of their success when you feel like a failure. But take heart, you are not alone. Teaching reading can be challenging and you might not see success for a while-but your time will come. All kids have their own time table. You child will read one day. It just might not be today. Give your child and yourself some grace as you work through reading lessons together. Don’t forget that this is a new skill for them that will require repeated practice before it’s mastered. Know that it’s ok to take a break for a few weeks or months to wait until your child is more ready. Don’t fall into the trap of comparing your child to friends or even your other children. Get professional help if you think something is off. Make sure to have their eyes examined each year to spot problems early. Try to stay positive as you encourage your child in his or her efforts to read. As you work to teach reading, don’t stop reading aloud to your child. The rest of the Crew is sharing about the subjects that are struggles at their house. Read more here! I use All About Reading to teach my children. To learn more about this curriculum, you can visit the website through my affiliate link below. I agree- he will get it! Each child on his own timeline! Have you tried PAL? We had HGUE success with it and cannot recommend it more. Plus, it is fun to use with lots of game type activities. I am convinced it is what got my son reading! He's actually made huge strides this week and is starting to do very well. He's reading more fluently now and we're excited to see the progress. We are using Logic of English Foundations which has lots of fun games and movement in the lessons. It's so easy to use and I love it! We also use All About Reading Level 1. We tried PAL and it was not a hit at all here. It was very disjointed to me and my kids struggled with the random sight words. It induced many tears and frustration. The systematic teaching (and clear teacher's notes) of both Logic of English and All About Reading are much easier for me! Now I have to start teaching Bee to read! It's never ending! Bleh. I have a struggling reader. It's really disheartening. He's 9, and I really thought he'd have it by now. You know how hard it is to teach 4th grade to a child who's convinced he can't read? Painful. 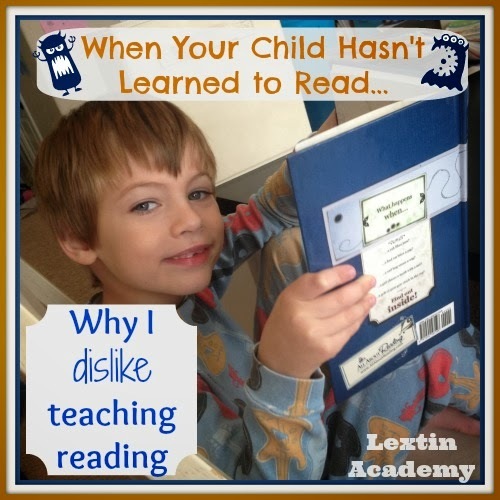 My second son was on the very late end of that "normal" range for learning to read, and it was tough. Especially after the first boy learned to read early and almost effortlessly. I thought there was something terribly wrong with me or Boy#2 or both because it was such a struggle compared to Boy#1. It was such a relief to realize he just needed more time and a slightly different approach. It can be so hard to watch then struggle! I so want him to read! But we'll get there. I just don't enjoy the process at all!!! You're welcome! Teaching reading to my little guy has been very frustrating to me because it is taking forever! We've been able to pick back up with AAR and now we're seeing some real progress. I just don't think he was ready even though he wanted to read. I still really enjoy the program though! Oh Lexi. Not sure how you do it all. It took me bringing the youngest home to get his reading to start succeeding. He still hates it and has no memory retention for it, but we're finally there. Spelling is finally, finally, starting to stick. Writing? Psh. Sigh. Any writing. All writing. Forget about it. So glad math and science come naturally to him because I need at least one win. Take care of you (because I know you're taking care of the little ones).